Many discovery services act more like a “portal” than a self-contained user experience. 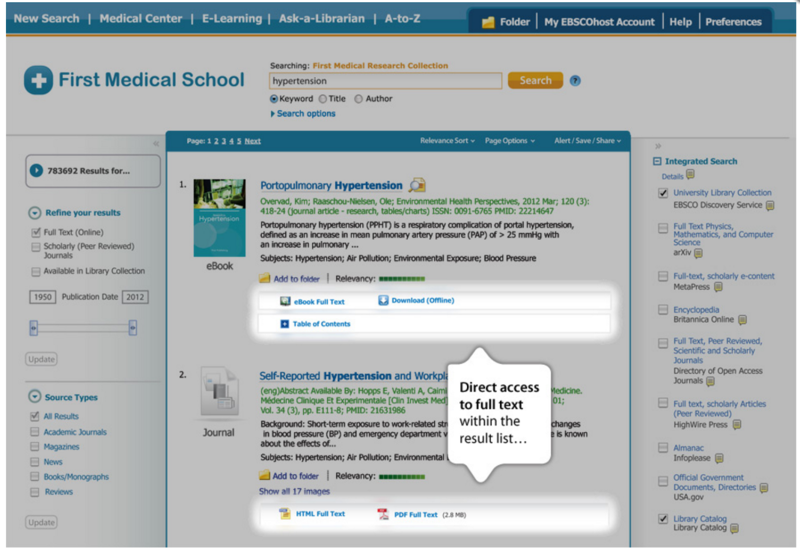 This is true when it comes to full-text access—while other discovery services rely on link resolvers that take the user out of the discovery system 100% of the time, only EBSCO Discovery Service provides users with direct access to full text when available through the library (link resolvers are used when needed). 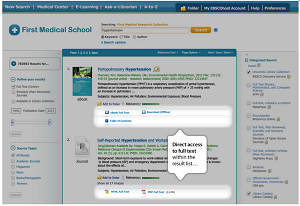 By leveraging EBSCO's SmartLinking technologies, EDS provides users with one-click access to PDF or HTML full-text content directly through the detailed record or from the result list preview pane. A majority of universities around the world subscribe to leading full-text resources from EBSCO, including databases, e-books and individual e-journals. Full text for these resources can only be found through EBSCO Discovery Service (subscription required), including renowned research databases such as Academic Search, Business Source, Communication & Mass Media Complete, CINAHL with Full Text, etc.—no other discovery service can offer such a superior depth of full-text coverage.